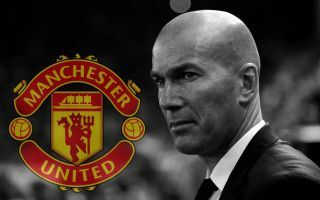 The Zinedine Zidane to Manchester United talk just isn’t going away as Jose Mourinho’s future continues to be the focus of the season early on. The Red Devils have made a poor start with two defeats from their opening three Premier League matches, with the s**t really hitting the fan in the 3-0 home defeat to Tottenham on Monday night. CaughtOffside have been told by sources close to Zidane that he’s already been in touch with Paul Pogba and Anthony Martial about expecting to replace Mourinho – and that that looks to be behind the latter’s sudden openness to sign a new long-term contract. While this is nowhere close to being a done deal, the Daily Mail report that Mourinho’s job is on the line if his side lose their next game to Burnley. Yes, yes, I can already hear you screaming: “ANYONE COULD WIN THREE CHAMPIONS LEAGUES IN A ROW WITH THAT TEAM”. Just stop, please. It’s undignified. The point is, we have this strange habit in football of playing down any achievement – we did it when Pep Guardiola won everything under the sun at Barcelona (all thanks to Messi), we continue to do it with him at Manchester City (no Messi, but would you look at all that money?). Hell, some people even managed to do it when *Leicester City* won the Premier League (they were lucky that the top six had all had a bad year at the same time, apparently). Yes, Zidane had great players at his disposal at Real Madrid. Yes, he wouldn’t really have many if any close to that in this current United squad. And yet, before this untalented bald Frenchman came along and scooped up three Champions League titles in a row, Real had won the trophy just once in the preceding thirteen seasons – even with Cristiano Ronaldo on their books for much of that period and numerous other Galacticos alongside and before him. Clearly, Zidane brought something out in this group that other managers could not (Mourinho included, let’s not forget). He made few signings, built a strong team spirit and created a big-game mentality that saw them conquer Europe in a way that no team has in decades – the last side to win three European Cups in a row was Bayern Munich in 1976. In case that’s not enough, that’s more European Cups than Mourinho has won, his last one coming in 2009/10. Can you honestly say he’s been nearly as impressive a manager since then? While he used to inspire his players to be winners, he now demoralises them and makes good teams worse. You can’t say that of Zidane, who in his first managerial job took control of a dressing room full of big names and egos and took them to another level. Some point to Zidane and cannot see a particular tactical system, which in this day and age pretty much makes you a caveman in the eyes of some, but it may also be a big strength. The 46-year-old does not seem wedded to one philosophy or approach, but his Real Madrid teams played fast, effective, clinical football. In many ways, it was reminiscent of United under Sir Alex Ferguson – do whatever it takes in any given match to get the result needed; play to your strengths; win at all costs. One imagines there is a bit more subtlety to it than that behind the scenes, but, like Ferguson, it feels like 50% of the performance comes from the iconic figure that Zidane is. One of the greatest players of all time, he has an aura about him that commands respect, and is clearly a superb motivator. In short, he’s precisely the opposite of Mourinho right now, who seems to just bring his players down, making them look like a lesser version of themselves in nearly every game. And when things go wrong – everyone now knows what’s coming. There’ll be no more bus-parking by Zidane. The only three signings Madrid made under Zidane were Alvaro Morata (brought back for his buy-back clause at Juventus), Dani Ceballos and Theo Hernandez. None were essential members of his squad. Between taking over in the middle of 2015/16 and stepping down this May, Zidane barely changed anything in this Los Blancos squad. Of course, signings are less of a priority when you have the likes of Ronaldo, Gareth Bale, Isco, Sergio Ramos and all the rest in your squad, but it’s still a pretty impressive feat that’s almost unheard of in the modern game. Mourinho, meanwhile, spent all summer complaining about transfers. The effect of that is obvious – it creates tension between the manager and board level, with Ed Woodward seemingly not backing the Portuguese in the transfer market, and between the manager and the players, many of whom will now undoubtedly be feeling they’re not good enough for the Red Devils boss. Zidane is a more modern ‘head coach’ and doesn’t seem to be too bothered about ordering his club around in the transfer market. Not once did he whinge about a lack of investment, and that allowed him to get on with the part of the job Mourinho seems to have overlooked.